“We have security cameras to protect them,” Jennifer, from Houston, Texas, told ABC News. The private webcam, aimed at the beds of her two eight-year-old girls, was intended to keep a watchful eye over them but it had been hacked and the live footage was open for anyone to view. Now, agreed: That is a horrible thing to find out. But my sympathy for Jennifer is tempered by the idea that it would have been just dandy if the camera had only been used the way the mom intended, which was for HER to be able to watch her kids in their room any time she chose to. I grew up knowing that behind my bedroom door I was truly alone. Even those of us who grew up sharing rooms knew that if no one else was in the room, no one else was watching. That means something. Had my mom had installed a camera, secret or otherwise, this would have been an act of gut-wrenching betrayal. Besides, what kind of crime does this mom think the camera would have prevented? An intruder? Would she be watching every second of the night to make sure no one snuck in while the kids were asleep? Or was she simply eager to have a video to turn over to the cops in case this mind-bendingly rare event occurred? Really — what does a “watchful eye” do? A watchful eye is a suspicious one. The only place I know of where bedrooms are routinely monitored by camera is prison. This is the ABC video. 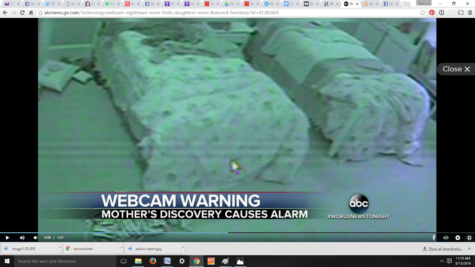 A mom was horrified to learn her kids’ bedroom webcam was hacked. If I were her daughters, I’d be horrified to learn my mom was filming me. Sounds like they are in more danger _from_ the camera. Not long ago, the mom of the little boy I babysit came rushing home in a tear. She had left in a bit of a tear too, leaving me without the ipad to watch live footage of her baby sleeping- and, as it happens, I didn’t have a phone on me. The mom, however, was able to watch footage of her baby from her iphone, and what she saw was baby lunging at the camera, live wires and all! He was fine. By the time she came home, I’d already gotten the baby up after I heard sounds of stirring. Still. A bit of an ironic situation to say the least. I wonder if the parents have a camera hooked up in their room for “security” purposes. . . Idiot. Unless the kids have some severe disabilities, there is no reason 8 yr olds need to be monitored by cameras in their bedroom. At what point was she planning to remove the cameras? At 12, 15, 18? Would she like it if her husband set up cameras to monitor her in the bedroom when he isn’t home? If this whack job is actually recording the feed is she not producing child port? You have to be really mentally ill to put video cameras in your kids room. That’s just sick. Not only this, but apparently the kids had installed a game that requested the name of a server, and instead of asking mom what to do, did an online search to find an unprotected server, thus initiating this whole debacle. And now her kids aren’t allowed on the internet. Hey, mom: you screwed up. Best learn from this event and pass that learning onto your children. Instead, you locked everything down and taught your kids the wrong lesson. Totally agreed. My room is next to my kids room, the walls are thin enough my wife and I can hear everything they do and say, unless they talk in whispers. They know it, but every night its the same drill. Dad: I CAN STILL HEAR YOU!!! Go to sleep…. Great, you’re (a) creepily intrusive into your daughters’ lives, (b) too stupid to secure your security system and so (c) the girls get punished for it. Great. Monitoring 8 year olds?! That’s insane! Unless they’re disabled and at risk of climbing out the window and running away or otherwise hurting themselves, that’s completely nuts! But it’s perfectly OK if YOU do it to your own children? Either way, it’s an illness. A closed door is a beautiful thing. I have boys so maybe I’m not naturally scared of everything enough but I cannot imagine wanting to see what pre-adolescent boys get up to. Nor adolescent boys for that matter. I already “know” what happens but I do not need details. What are the parents watching for in the first place?? If they’re concerned about a stranger crawling in through the window then why is the camera trained on the beds? If I were that sort of paranoid I would have it pointed at the window. Are you watching to make sure your children behave? That’s just kind of miserable. How absolutely sad that the girls will grow up knowing they are never out of view of someone. Always having to be on good behavior. Paranoid about getting changed. As for me, I love coming home in the evenings and locking my bedroom door for ten minutes. No one is walking in, no one is watching, no one is talking to me. I can change my clothes in peace, take a few minutes to decompress and then I go back out and handle dinner and kids and household stuff. But for that 10 minutes I’m absolutely on my own. It’s such a relief. Ok we all know about Polly Klass but what happened to her was extremely, extremely rare. So regarding a pervert crawling thru the window during the night, how is the mom and dad suppose to see that on the video if they’re sleeping themselves and even during the day when the girls are in their room playing, is the mom gonna keep her eyes fixed on the video the whole time the girls are in their room? I think installing video surveillance in the room of your child only serves as a feel-good thing but is really a waste of time and money. We do have a security camera in my daughter’s bedroom. Why? My husband. I had this security system stashed in a box, and in lieu of a baby monitor he rigged up the camera! She’s now three and we haven’t turned the system on in over a year. Here’s an idea: If you’re worried, go check on them. Personally. This is ridiculous. Her camera wasn’t hacked, she just failed to secure it. I can find hundreds of unsecured cameras across the world with a simple Google search — that’s not hacking. The idea that someone out there is running a free server just to collect IPs so that they can then probe them for vulnerabilities is also ludicrous. Yep. Punished the kids, but didn’t actually remove the problem. I think those baby video monitors are unnecessarily obtrusive, I can’t imagine spying on 8 year olds like that. Privacy was important to me when I was eight years old. I am grateful my mother respected my right to be alone. The mom said that strangers watching her daughters dressing is a parent’s worst nightmare. Oh really? It would have been preferable if her daughters were crushed to death in a car crash? The amount of responsibility, consistency, and honesty that kids show should be equal to the level of privacy they’re allowed to have in their rooms. Seriously, if they’re 8 and you’re still monitoring them, there’s something wrong. Did a Shopkins trade go sour? What did they do to deserve this invasion of privacy? My mother taught us to respect each other’s privacy and always knock first and wait for a “come in” before entering a room. We had a large family but arguments were minimized when we each got our personal space. That’s what this is about, personal spaces. I don’t know why mom is all worked up that her daughter’s personal space and privacy are violated…she is doing this herself under this guise that it’s part of being a good parent. It’s not, and I would say rather obsessive and misguided instead and not at all healthy for developing trust in children. Always being watched will give them anxiety instead. I wonder what it would take for people to realise that they have made it less safe, not safer? I can understand having a video monitor in an infant’s room, particularly if the infant has a medical condition…but, honestly, why the hell did they feel the need to have a camera in the room of their 8 year olds?! That just screams HELICOPTER PARENT WARNING WARNING! Sounds like the problem is the parents. Not that the camera violation isn’t a big deal because, obviously, it is…but it wouldn’t be an issue in the first place if parents didn’t feel the need to constantly helicopter their children. This puts me in mind of a really interesting conversation I has with my 9 year old a few weeks ago. We talked at length about the difference between secrets, surprises and privacy. It started with me telling her there should be no secrets between us, she should tell me everything. What about your birthday present, she asked? Good point, my girl. So we talked about secrets vs surprises. But what if my BFF tells me something but she doesn’t want me to tell you, she asked? Another awesome question from my thoughtful girl. So we talked about telling vs tattling, and discussed what sorts of things she would or would not tell me despite the BFF’s wishes. And then… but Mommy, I don’t think you should be allowed to read my journal… (She really is one smart cookie, that one). And so we hashed out privacy and secrecy, working through it together, discussing what we each feel comfortable with. I don’t want my kids to have any secrets from me, but they are most certainly entitled to their privacy. The degree of privacy changes over time as they get older. But I fear that our society is quickly forgetting the important distinction between secrecy and privacy. Is hacked the right word here? Security cameras that are able to be accessed remotely by the owner… are also able to be access remotely by anyone (given the right protocols – this is of course hacking). However, I heard about this problem on the radio some time ago, one particularly company (prominent in Russia) had no security protocols at all, so the stream did not require any sorting hacking to access them… Just the right address. There is a huge difference between finding out your camera feed was accessible, and anyone actually caring enough to access it. This really strikes a nerve with me. Worst first thinking can get out of control. I hate it how people can be so blind. It’s as if they focus so hard on a CSI episode that they can’t imagine that overprotection/control freakishness can grow to be a monster! This monster is REAL! It isn’t the boogieman. I’m only guessing that this pet peeve of mine applies with this story. of their overprotection/control freakishness caused her to rebel so much. Children go off the rails sometimes and this has nothing to do with overprotection or underprotection. Perhaps this all started when she was 6 years old but she was not allowed to play in her own front yard unless mom was supervising. The vicious circle starts on very small things. Overprotect, rebel, overprotect, rebel, overprotect, rebel, overprotect, rebel, overprotect, rebel…..
As I said, I’m speculating. This may not be the case in this instant. However I hate how people can’t imagine how worst first thinking can get out of control. Ok I jumped the gun. She’s only 8. She probably isn’t sneaking out of the house – yet. She will if her parents continue on this path. Maybe. Most people who have Internet service use a router that allows them to connect multiple devices to the Internet, using only a single public address. These routers normally do not allow incoming connections… only outgoing. So, normally, an IP-enabled camera would only be “visible” to the private network on the “inside” of the router, and not to the public Internet on the “outside” of the router. If the router is hacked, however, it will accept connections that originate from the Internet to connect to the devices on the private side of the router. Many people get their router from their Internet provider. Ordinary prudence says that the device should only accept reconfiguration from the private side of the device, and not from the Internet side… but often the ISP will set the default setting to allow reconfiguration from the Internet side… because the ISP is on the “Internet” side, and often people need to have the ISP’s tech support staff reconfigure the device. These sorts of technological solutions are only going to cause rifts in the family. What most parents don’t seem to think about is the long term consequence not just on their child’s own life, but on the parent’s. The kid is going to grow up and more likely than not be BETTER at it than their parent and one day that mom is going to wake up with a camera in her room that she can’t see and a concerned child who just wants to make sure that her 50-year-old mother isn’t the one in a million who gets early onset dementia. Or maybe being raised all innocent-like she’ll see something her parents are doing that’s a bit risque and call the police because she thinks its spousal abuse. What goes around comes around. Raise a child who is used to the all seeing eye and one day that eye will be watching you instead. I believe some parents have been conditioned from when their kids were young to *feel* better when they can see their kid at all times. Daycares offer cameras to view for parents to check in on their kids (many doggie daycares do too!). I belonged to a gym that had a camera channel on the childcare room so I could run on the treadmill and see my kids. Cable companies have enhanced *security* features including cameras to keep tabs on older kids. Like I want to see who grimed up my kitchen making smoothies this morning. I want to bingewatch Stranger Things on netflix. I love that her stupid overprotective ways backfired on her, but appaerently she also isn’t smart enough to solve the problem and realize SHE is the one that should be banned from the internet. I wondered the same. Their wedding day, probably. So 50 is waaaaay too late (since extremely small risks never stopped these people from worrying…). Personally I would hate to have had video streams of even my young babies. I’ve watched Paranormal Activity and the like …imagine if you caught your baby spider-walking up the wall with a weird look on its backward-turned head? No thank you, if my kids want to get up to creepy activities with awful creatures, I’d rather not see :-). I notice that the camera isn’t directed towards the windows, so security doesn’t seem to be the intention. I can just imagine their breakfast table conversation, telling one girl not to pick her nose, and the other not to hit her sister. This “Jennifer” is a creep. Also, the only way this camera could’ve been “hacked” is if it was wireless, and it’s very simple to encrypt and password-protect that wireless link. What this means is that there was no “hacking” involved at all – this idiotic excuse for a parent was broadcasting video because she was too stupid to set up a wireless link properly. I have zero sympathy for her, she was the one endangering them. The kids, though, should be asking for foster care. Personally, if I were at the gym I wouldn’t want to stare at my kid during my workout. Isn’t that the whole point of on-site child care, so that someone else is keeping an eye on my kids while I do something for me? Oh, so selfish, I know. The girls’ mother was informed about this horrible, nightmarish violation of her children’s privacy (caused by her own stupidity) by a woman in Oregon, who posted a screenshot of the camera footage on Facebook and smugly crowed about how she couldn’t imagine how awful the girls’ mother must feel. These people need something better to do with their time. Nobody got in her house, the way the kids’ mother insisted they did. People were able to look at her children in their room through their computers because she allowed them to, due to her own ignorance about how technology works. And by calling it a “horrible, nightmarish violation” I was being sarcastic. You’d think Hannibal Lechter ate them, instead of what really happened, which was strangers got to look at her kids. Big deal. My accessories,including my phone,laptop,credit card and ID were stolen. My private and business Instagram account was hacked as well as my emails and Facebook and I was blocked off on all of my social media accounts. It was really a disaster as I was living like a ghost. Then I thought of hiring a hacker to help me retrieve all of my accounts back. Initially I was doubtful but when I got all of my accounts back I had to testify that this hacker is out of this world. This is my testimony you can get to him at computerworm.hacker@hotmail.com and you will be amazed too. Thank me later.